Basking sharks have been spotted off the coast of Cornwall. Sightings of two sharks swimming close to shore along the south coast near St Mawes were reported to coastguards on Wednesday morning. Several of the large creatures, which can grow to be longer than a double decker bus, appear off the South West coast every summer. Sightings of the sharks generally begin when a spell of good weather increases the surface temperature of the sea. 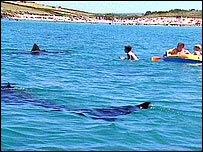 Ken Bazeley from Falmouth Coastguards said the sharks quickly attracted spectators. He told BBC News: "The basking sharks were reported just off the coast between us and St Mawes and we've already had boats out looking at them this morning. "I'd imagine they're heading towards the Lizard, but one of them was about 20ft (6m). "Basking sharks are harmless, but they can make the old ticker go a bit quicker if you're in the water with them."